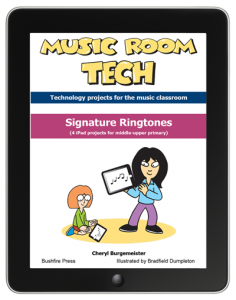 A series of iPad projects for the music classroom by Cheryl Burgemeister. Suitable for students in middle to upper primary. Are you teaching with iPads in the music classroom? Signature Ringtones contains 4 sequential iPad projects (each taking 1-2 lessons) using the apps Explain Everything and GarageBand. This eBook includes downloadable clipart images, charts, handouts and printables, audio files to play, and simple step-by-step visual instructions. Everything you need to teach an exciting unit of inquiry using iPads! Assessment and planning documents are included for Australian Curriculum, AusVels and IB PYP (International Baccalaureate Primary Years Program). These projects are easy, fun and engaging! A great way for your students to explore and manipulate educational music apps. Several samples and screenshots of the book are available in the iBooks store!